The oval-shaped, beautifully patterned foliage of the prayer plant has earned it a favored spot among houseplants. Indoor gardeners love these plants, sometimes too much. When prayer plants turn yellow, it’s often because of environmental problems, but a few diseases and pests could also be responsible. If your prayer plant is turning yellow, read on to find out the possible causes and their treatments. By far the most common Maranta prayer plant problems are caused by incorrect care. Bright lighting or excessive phosphate or fluoride can cause leaf tips and margins to burn, leaving a band of yellow tissue between the healthy and dead tissues. Chlorosis causes yellow prayer plant foliage, especially on younger leaves. Move your plant to a location with indirect light and begin watering with purified water. A dose of liquid iron fertilizer mixed per package directions can help correct chlorosis, provided the pH of your medium is around 6.0. A soil test may be in order, or it could be time to repot. Helminthosporium leaf spot is a fungal disease that causes small, water-soaked spots to appear on prayer plant leaves. These spots soon yellow and spread, eventually becoming tan areas with yellow halos. 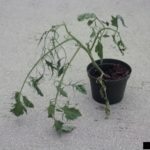 This fungus takes hold when plants are chronically over-irrigated and leaves frequently are covered in standing water. Correct the irrigation problem to eliminate future risk of disease and water only at the base of the plant in the morning, so that water evaporates from splashed surfaces quickly. An application of neem oil or the fungicide chlorothalonil can kill active disease, but prevention of future outbreaks is vital. The cucumber mosaic virus may be responsible for yellowing leaves on Maranta, especially if the yellowing alternates with otherwise healthy green tissue. New leaves may emerge small and distorted, older leaves develop yellow line patterns across their surfaces. Unfortunately, there’s nothing you can do for plant viruses It’s best to destroy your plant to prevent other houseplants from contracting the virus. 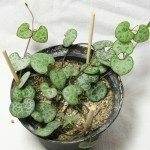 Read more articles about Prayer Plants.